The Supreme Court came down heavily on the Centre and the Archaeological Survey of India (ASI) on Wednesday for not being able to protect the Taj Mahal. It even asked them to either “shut it down” or “demolish or restore” the Mughal structure built by emperor Shah Jahan in memory of his wife Mumtaz Mahal. The apex court was upset with the Uttar Pradesh government that had failed to come out with a vision document to protect the Taj Mahal. 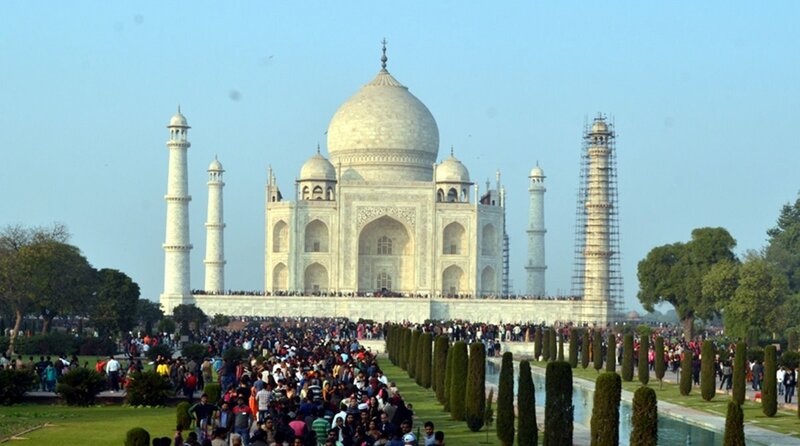 A bench of Justice Madan B. Lokur and Justice Deepak also expressed displeasure with the authorities for not making any effort to preserve the Taj Mahal, and slammed them for showing “sheer lethargy” in the matter. “There is absolutely no willingness to protect the Taj Mahal. Pristine beauty of Taj Mahal has to be protected. You can shut down the Taj Mahal it demolish it. Restore it if you want or demolish it if it has to be demolished,” said the bench. Stating that the Taj was more beautiful than the Eiffel Tower in Paris, the court said the iconic monument could have solved the country’s foreign exchange problem. “There is the Eiffel Tower in Paris. Perhaps it is nothing compared to Taj Mahal. Our Taj Mahal is more beautiful. 80 million go to watch Eiffel Tower which looks like a TV Tower. This is eight times more than what we have. If you had looked after it, your foreign exchange problem would have been solved. The Uttar Pradesh government had earlier told the court that it would place before it a draft of the vision document on protection and preservation of the Taj Mahal. The bench said it would hear the matter on day-to-day basis from July 31, and asked the Centre to furnish full details of the steps taken and action required to be taken to protect the monument. The Centre told the bench that the Indian Institute of Technology, Kanpur was assessing air pollution level in and around the mausoleum and would give its report in four months. It said a special committee had also been set up to find the source of pollution in and around the Taj, which would suggest measures to prevent it. The bench said no concrete steps had been taken by the government, despite a parliamentary standing committee report on Taj’s protection. On 1 May, the top court had expressed concern over the changing colour of the Taj Mahal and pulled up the Uttar Pradesh government and the Archaeological Survey of India. Asking if anybody had any clue about the colour of the white marble monument turning brownish, a bench of Justice Madan B. Lokur and Justice Deepak Gupta had asked the Central government to take the assistance of Indian experts or from abroad to see the extent of damage and if it could be reversed and the steps that could be taken to check it. The court expressed its concern after petitioner-in-person MC Mehta produced some photographs showing that the Taj was turning brownish. The court was hearing an application regarding felling of trees in the Taj Trapezium Zone. On February 8, the top court sought from the state government a detailed vision document for protection and preservation of the centuries-old monument. It also inquired why there was a “sudden flurry of activities in and around the Taj Mahal and the Taj Trapezium Zone (TTZ)” and why leather industries and hotels were coming up there. During its February 8 hearing, the court had directed the Uttar Pradesh government to give details of the number of trees planted in and around the Taj Mahal and in the TTZ — a 10,400 sqkm area spread over the districts of Agra, Firozabad, Mathura, Hathras and Etah in Uttar Pradesh and Bharatpur in Rajasthan.